Adult individual in the aquarium. Male specimen from the aquarium trade, with reduced colour pattern likely due to stress. Female from the aquarium trade. Specimens on sale in the UK aquarium trade. 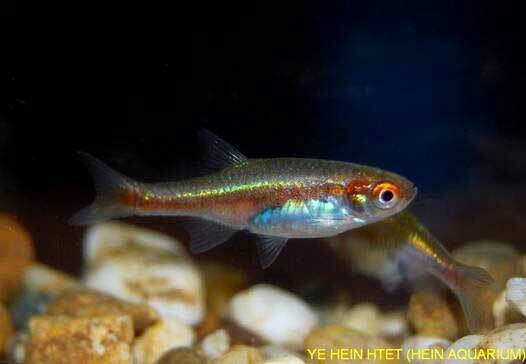 Microrasbora: Microdevario: from the Ancient Greek μικρός (mikrós), meaning ‘small’, and the generic name Rasbora, in allusion to the small size of this genus and its superficial similarity to the Rasbora grouping. This fish is collected alongside Celestichthys margaritatus which was initially thought restricted to a single locality around 1,040 m AMSL near the town of Hopong in Shan State, eastern Myanmar, but is now known to occur in waters associated with the Salween (aka Thanlwin) River throughout southern Shan and even across the border in northern Thailand. It is unclear if M. cf. rubescens shares the same pattern of distribution but it is certainly feasible. The type locality of C. margaritatus is an area of permanently-flooded grassland formed by the damming of a spring for agricultural purposes. The water is only around 30 cm deep, transparent and supports dense growths of aquatic plants, mostly from the family Hydrocharitaceae which includes such genera as Elodea, Egeria and Blyxa. Other sympatric species included Devario sondhii, an undescribed Petruichthys known to aquarists as the ‘rosy’ loach, and Channa harcourtbutleri. From images most of the the other habitats look broadly similar, i.e., shallow areas of wetland surrounded by open grassland, though at least one population was supposedly discovered in ‘deep forest’. Base dimensions of 60 ∗ 30 cm or equivalent are recommended. 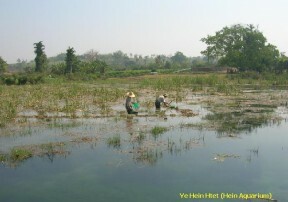 pH: 6.5 – 7.5; a value of 7.3 was recorded at the habitat near Hopong. Hardness: The water in northern Myanmar is typically soft so aim for somewhere within the range 18 – 179 ppm. Newly-imported specimens are often in poor condition and can be difficult to acclimatise to aquarium life. Small live foods are therefore recommended as an initial diet with dry and frozen products being introduced as the fish become settled. The closely-related Microrasbora rubescens is not recommended as these two may be capable of hybridisation. It is a shoaling species by nature and a group of at least 8-10 specimens should be purchased. Maintaining it in decent numbers will not only make the fish less nervous but result in a more effective, natural-looking display. Males will also display their best colours and some interesting behaviour as they compete with one other for female attention. Mature females are usually deeper-bodied and noticeably larger than the more compact, intensely-coloured males. Spawning normally presents few problems with around 30 mildly adhesive eggs deposited in a typical event. The adults are best removed post-spawning as they will eat any eggs or fry they find. Incubation is temperature-dependent to an extent but normally around 72-96 hours with the young free-swimming 1-2 days later. Initial food should be 5-50 micron grade, introducing Artemia nauplii, microworm, etc., once the fry are large enough to accept them. This is possibly an undescribed species and has been marketed as ‘Asian Cardinal Rasbora’, M. sp. ‘rose blue line’ or M. ‘thuzari’ in the ornamental trade. It differs from M. rubescens by its larger adult size, possession of a greenish to bluish lateral stripe, and lesser extent of orange pigmentation on the body. It also appears to represent a distinct genetic lineage (Collins et al., 2012). Devario sondhii can also appear comparable at first glance but orange pigmentation is restricted to the rear, ventral portion of the body and it possesses a dark cleithral spot just behind the gill plate. Devario acuticephala is also broadly similar in patterning but of Indian origin and it possesses a rough-edged, dark stripe extending laterally from the caudal peduncle along the majority of the body. The genus has undergone a number of systematic changes in recent years but currently contains only M. rubescens. A phylogenetic study by Fang et al. published in 2009 revealed that other species formerly included in the grouping are more closely allied with Devario and reclassified them as members of new genus Microdevario, further separated from Microrasbora by differences in some aspects of internal morphology. M. rubescens was also found to be closely related to Devario and the authors conclude that ‘its status as a valid genus is contentious and the molecular data suggest inclusion or close relationship with Devario‘. The two were not synonymised because, unlike those species moved into Microdevario, M. rubescens does not share any derived morphological characters with Devario and in the tests performed the precise level of relatedness between the two could not be settled upon. The evolutionary pathway leading to small adult size in Microrasbora has been referred to as miniaturisation, characterised by sexually mature adults with a significantly reduced size of less than 20 mm SL. Among bony fishes cyprinids are one of the few groups in which this phenomenon occurs repeatedly across numerous genera. Most show a preference for still or slow-moving, often nutrient-poor, habitats such as forest peat swamps.